Building and running your organization starts with compute, whether you are building enterprise, cloud-native or mobile apps, or running massive clusters to sequence the human genome. AWS offers a comprehensive portfolio of compute services allowing you to develop, deploy, run, and scale your applications and workloads in the world’s most powerful, secure and innovative compute cloud. The Magic Quadrant for Cloud Infrastructure as a Service, Worldwide** evaluates 6 vendors in the global market for Cloud IaaS. 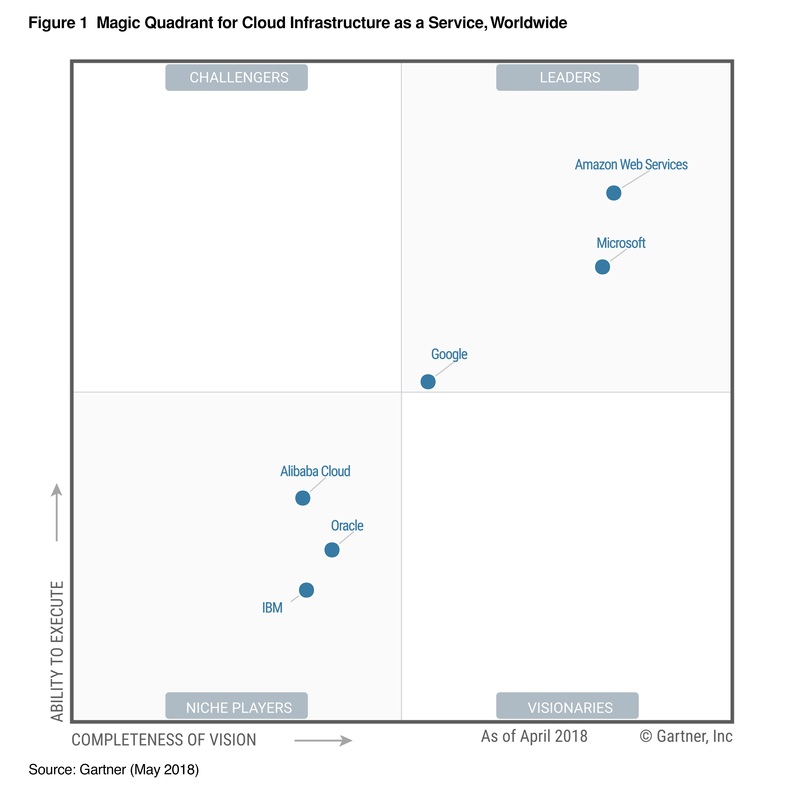 Amazon Web Services was placed in the Leader Quadrant again, with the highest position in ability to execute and furthest position in completeness of vision. *Based on downtime hours from 1/1/18 to 12/31/18 pulled directly from the public service health dashboards of the major cloud providers. Our vision is to be the compute platform for the world and we are investing and innovating at global scale to support virtually any workload and business need. Having everything is everything and we continue to make our platform easier, faster, and more efficient. With AWS, there are no compromises. AWS offers a far broader selection of services along with much deeper functionality within most of these services than any other cloud provider. We offer choice of operating systems with Linux and Windows and choice of processors with Intel, AMD, NVIDIA, and the AWS-built Graviton processor. We provide a broad choice of instances either general purpose or optimized for specific needs such HPC, big data, and analytics, as well as new capabilities with bare metal, attached storage, and enhanced networking. AWS offers 210 security, compliance, and governance services and key features which is about 40 more than the next largest cloud provider. We also support 89 security standards and compliance certifications including PCI-DSS, HIPAA/HITECH, FedRAMP, GDPR, FIPS 140-2, and NIST 800-171, which is meaningfully more than any other cloud provider. For encryption, all AWS services that store customer data offer the ability to encrypt that data and we offer encryption across 116 different AWS services which is 3x more than any major cloud provider. We have built the largest global network with 144 points of presence connected by 100 Gbps trans-oceanic cables that deliver customer applications and content anywhere in the world over a private network. With our C5n and P3dn instances, we are also the only cloud provider with compute instances that deliver 100 Gbps of networking throughput, which is one reason why more HPC and machine learning workloads run on AWS than anywhere else. AWS provide a full portfolio of storage options including Amazon EC2 Instance Storage, Amazon Elastic Block Store (EBS), Amazon Elastic File System (EFS), and Amazon S3. Amazon Lightsail offers the easiest way to get started with AWS. As your usage grows, you can use Amazon EC2 Spot Instances to reduce costs up to 90% or to accelerate performance for fault-tolerant workloads such as big data, containers, web services, and CI/CD. AWS offers the most elastic, scalable platform for High Performance Computing. Users can deploy a creative studio in the cloud by scaling rendering, virtual workstations, and data storage globally with AWS Thinkbox Deadline, Amazon EC2 and AWS Cloud storage options such as Amazon FSx, and more. We have the best global infrastructure for running workloads that require high availability with 61 Availability Zones (AZ) across 20 Regions. AWS provides >2x more regions with multiple availability zones than the next largest cloud provider (20 vs. 8). This is one reasons why the next largest cloud provider had 7x more downtime hours than AWS in 2018*. We offer options for edge computing and hybrid cloud including Snowball Edge, VMware Cloud on AWS and AWS Outposts. AWS Outposts bring native AWS services, infrastructure, and operating models to virtually any on-premises facility. Amazon Elastic Compute Cloud (Amazon EC2) is flexible service that provides resizable cloud-based compute capacity in the form of EC2 instances, which are equivalent to virtual servers. Lightsail is an easy-to-use cloud platform that offers you everything you need to build an application or website, including: virtual servers, storage, managed databases, DNS management and static IP addresses – all for a low, predictable price. Amazon Elastic Container Service (Amazon ECS) is a highly scalable, high-performance container orchestration service that supports Docker containers and allows you to easily run and scale containerized applications on AWS. AWS Fargate is a container management service that allows you to run serverless containers so you don’t have worry about provisioning, configuring, and scaling clusters of virtual machines to run containers. Fargate can launch tens of thousands of containers in seconds and easily scale to run your most mission-critical applications. AWS Lambda lets you run code without provisioning or managing servers. You pay only for the compute time you consume - there is no charge when your code is not running. With Lambda, you can run code for virtually any type of application or backend service - all with zero administration. Amazon Elastic Compute Cloud (Amazon EC2) is flexible service that provides resizable cloud-based compute capacity in the form of EC2 instances, which are equivalent to virtual servers. You can commission one or thousands of instances simultaneously, and pay only for what you use, making web-scale cloud computing easy. We provide a broad range of instance types optimized to fit different use cases, and choice in how you pay for instances, so you can optimize your application based on business needs while minimizing costs. EC2 Spot Instances spare EC2 capacity offered at up to 90% discounts compared to On-Demand.&nbsp; EC Spot Instances can be used with &nbsp;fault-tolerant workloads such as big data, containers, web services, and CI/CD to reduce costs or accelerate performance. Amazon Lightsail is the easiest way to launch and manage a virtual private server with AWS. Lightsail includes everything you need to jumpstart your project – a virtual machine, SSD-based storage, data transfer, DNS management, and a static IP – for a low, predictable price. Launch in seconds with preconfigured operating system and application images and manage your resources easily from our intuitive console. When your app needs advanced features like managed databases, content delivery network, or any of dozens of other features, you can connect these additional AWS services to your Lightsail server. Lightsail plans start at only $5 per month. Amazon Container Services offer a broad range of products to help you deploy, manage, and scale containers in production. With AWS Fargate you can run serverless containers so you don’t have worry about provisioning, configuring, and scaling virtual machines to run containers. With Amazon ECS you get all the benefits of Fargate with the additional flexibility and control of operating the virtual machines on which your containers are running. Finally, Amazon EKS makes it easy to deploy, manage, and scale containerized applications using Kubernetes on AWS. AWS Lambda lets you run code without provisioning or managing servers. You pay only for the compute time you consume - there is no charge when your code is not running. With Lambda, you can run code for virtually any type of application or backend service - all with zero administration. Just upload your code and Lambda takes care of everything required to run and scale your code with high availability. You can set up your code to automatically trigger from other AWS services or call it directly from any web or mobile app. Lambda is the core of serverless computing, which lets you build and run applications and services without thinking about servers. **This graphic was published by Gartner, Inc. as part of a larger research document and should be evaluated in the context of the entire document. The Gartner document is available upon request from AWS. Gartner Magic Quadrant for Infrastructure as a Service, Worldwide, Dennis Smith, Lydia Leong, Raj Bala, 23 May 2018. Gartner Magic Quadrant for Public Cloud Storage Services, Worldwide, Raj Bala, Julia Palmer, 31 July 2018. Gartner Critical Capabilities for Public Cloud Infrastructure as a Service, Worldwide, Raj Bala, Lydia Leong, Dennis Smith, 24 May 2018.